Putting an in-ground swimming pool in your backyard is an exciting decision that will bring years of enjoyment to your family. But if you’re just beginning to look at your options, then it’s important to set the right expectations. As part of the installation process, you and your pool installers will need to make sure your backyard is properly prepped. Each backyard is different, so some spaces may require more steps than others. Permits: Any pool plans will need to be cleared by your local municipality. This process makes sure that your proposed pool meets local code and will be safe for use. An on-site inspection by local officials is generally required. 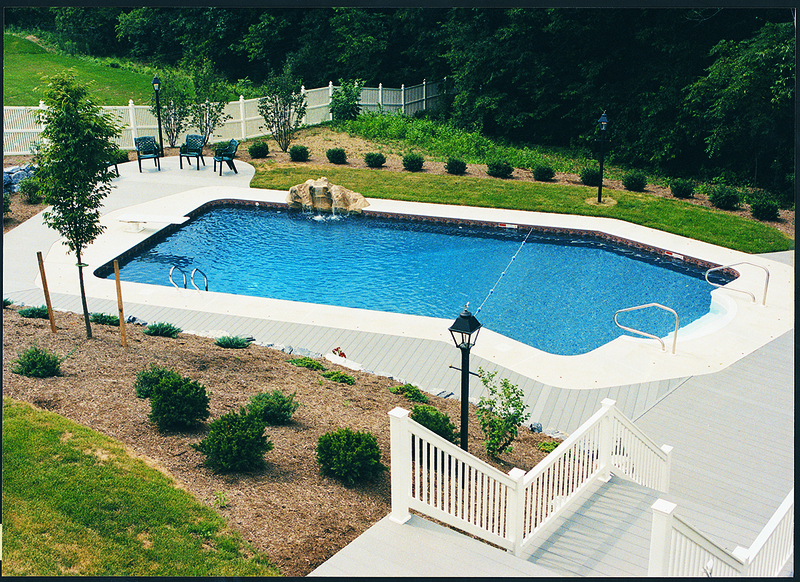 Yard slope and grading: The existing slope of your yard may affect your pool design options. Grading may be needed to level the ground where your pool will be placed. More extensive grading will play a role in the construction costs of your pool. Drainage: Proper draining is critical for every pool. When it rains, for example, you don’t want water running into your pool or onto your patio. Your pool installers will determine what draining methods will be needed to ensure water runs to a desired area away from the pool. Utilities: If there’s any existing utility lines in your backyard, those will need to be removed and/or rerouted. As part of the initial site work, your installers will inspect for electrical, gas, septic and water lines. Design, placement & usage: Should your pool be rectangular? Round? Angled? Curved? This decision actually depends on several factors, including how you’ll use the pool and what makes sense for your backyard. For example, active swimmers may prefer a longer, more rectangular pool that allows for swimming longer laps. Excavation: Lots of dirt will have to go! And, there are numerous factors that can influence how long it takes to dig up your backyard: weather, soil conditions and the ease of access for construction vehicles. Fencing: All swimming pools must be properly enclosed to prevent the risk of someone (particularly children) accidentally falling into the pool. Most municipalities require your fence to be at least four feet tall. Landscaping: Attractive landscaping is the key to making your backyard pool look truly incredible. But keep in mind that premium landscaping is an added expense on top of construction costs. Consider how things like trees, shrubbery and hardscaping can beautify your space. Completion time: How fast your pool is installed depends on a few factors, including the type of pool you choose. For example, one-piece fiberglass pools can be installed in as little as seven days, once the yard is prepped and the pool shell is ready. But things like weather, permits and inspections can also influence the completion time. Have questions? We have answers! At Crystal Pools, we’re here to make the installation process as clear and simple as possible. Give us a call or stop by to get started on your dream pool today.